The FBI and the National Security Agency have been pulling photos, emails and other personal information from the servers of nine U.S. internet companies, according to an explosive report in the Washington Post that describes a secret six-year snooping program. 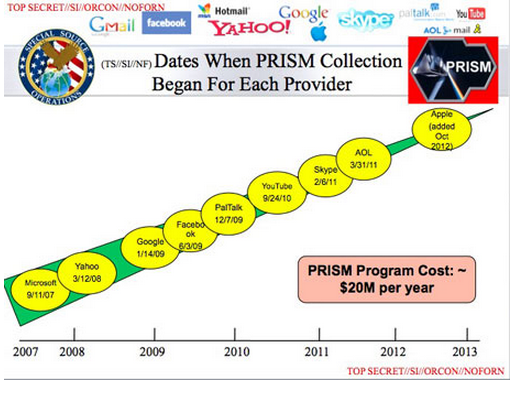 Highly confidential slides explaining the program, known as PRISM, say information gleaned from the companies’ servers contributed to 1 in 7 NSA reports and figured prominently in the President’s daily briefings. The slides appear to have been leaked to the Post. Update: According to a report in the Wall Street Journal, the government’s data-collection efforts also included information from internet service providers as well as credit-card and transaction-processing companies. The revelation of the program, which the Post said has expanded significantly in the last six years, is significant because it amounts to a wholesale domestic spying program on the millions of Americans who use common cloud-based services like GoogleDrive or Apple’s iCloud. The news also comes at a time that the federal government is under pressure over revelations that it allegedly pulled metadata for millions of phone calls involving Verizon subscribers. How people ever thought this wasnt happening is beyond me. One look at the vicious corruption that is the international banks (and their respective governments) should be more than enough to show you that our privacy is a big joke. NSA works for the banks. CIA works for the banks. FEMA works for the banks. As well as every other acronym organization we have. People need to worry less about symptoms of a problem, and more about the problem. Our privacy and every other one of our rights are being regularly assaulted because the government is controlled by the international banks, and they dont want us to have anywhere near as much freedom as we do. If people just keep focusing on the singular issues that upset them personally we will NEVER GET ANYWHERE. Look at the root cause instead. WHY are they all up in your info? WHY dont we have control over our govt? The international banks are the answer. Thats where our focus needs to be. A lot of people seem surprised by this, but I’ve assumed for many, many years that government agencies lie and do all sorts of illegal spying in the name of national security. If you want something to stay private, don’t put it on a frigging network! One might speculate that the “numerous inaccuracies” extend to a bunch of incorrectly placed commas and poor capitalisation of words. I’m sure it’s all for my protection and would never be used against me. I completely give up all my rights to the Federal Government. Politicians and their crony’s always know far better than I. Good to know who sold us out first. The fact that the program is “entirely legal” is entirely the problem. Legal does not mean constitutional. This needs to be tested in courts. Perhaps the the whole Patriot Act. And Microsoft wants to put an Always-On Camera and Microphone in my house via the Xbox One (which must call home, the NSA, every 24 hours)….. Interesting….